For a year and two months, an 80-year-old woman was made to sleep in the same room with the corpse of her 48-year old daughter who died mysteriously in Akwa Ibom State. The octogenarian, Madam Akon Etta, who hails from Osu Udesi, in Mbo Local Government Area of Akwa Ibom State, was accused of witchcraft and alleged to have killed her daughter, Dorcas Affiong Etim, who until her death, was trading in neighbouring Cotonou, Benin Republic. 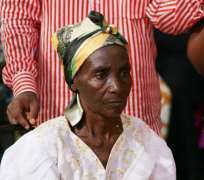 Trouble reportedly began for the aged woman, who is now taking refuge at the Synagogue Church of All Nations, Lagos, after she mysteriously lost four of her 12 children to various illnesses. P.M. News learnt from Mrs. Cherish Otoyo, Madam Akon's 34-year-old daughter, who came to testify to the incident at the Synagogue Church, that the late Dorcas had come from Cotonou, her base, for the burial of one of their late siblings. Dorcas, according to Cherish, arrived the village a day after the internment of their late brother and left after the burial activities were over. She further said that on returning to Cotonou, Dorcas became ill and was rushed back home where she died barely three weeks after the death of her brother. This incident, coupled with the declaration of a so-called prophet, who was later exposed as a fake, prompted the rumour that the old woman was a witch and had a hand in the successive death of her four children. Mrs. Otoyo, who resides in Ghana with her husband, Jere Otoyo, as missionaries, said the prophet told them that if they buried her late sister (Dorcas), one other person would die almost immediately. This proclamation reportedly scared the Etim family members and their community, forcing them to put Dorcas' burial on hold indefinitely. “Since the prophet said another person would die if we bury our sister, everyone was scared. None of us wanted to die and my brothers and sisters ran away from home. “The prophet also told them that there is the ghost of our late sister hovering around the house and they actually complained that they heard movements at night around the house. That was why they ran away,” she told P.M. News. The old woman was said to have faced persecution and ridicule from the villagers. When asked how she felt during the 14 month period the corpse of her daughter remained in her room, she lamented in tears that it was agonising. “It was a painful experience, I was always going into the room to light the lantern at night. “I also slept in the room at night with the embalmed corpse on the bed,” she recalled, adding that her relationship with the villagers became strained and she was also accused of inflicting some persons with barenness. “After the incident, they would attribute any death in the village to my purpoted witchcraft,” she said. Her ordeal was made known by her son-in-law and husband of Cherish (Mrs Otoyo) who visited the Synagogue Church for a prayer session. It was learnt that the church's head, Prophet T.B. Joshua, who exonerated Madam Akon of the allegation, also assisted the family with the burial of the late Dorcas recently. The church purchased the casket in which the corpse, which had become decomposed, was buried, as well as donated the sum of N150,000 and some bags of rice to the family. Commenting on the incident, Prophet Joshua, who called it 'a spiritual battle and one of the greatest deliverances in the history of mankind', added that activities of false prophets have caused a lot of damage to the world. “I have told her to forgive everyone who offended her and that she should also count on me, as I am now one of her children. “If this old woman had died innocently like that, there would have been a generational curse on the entire family and village because she is innocent and would have died in pains,” Joshua said.